"I don't want to be known as a beat-maker," Bryan Hollon, a.k.a. 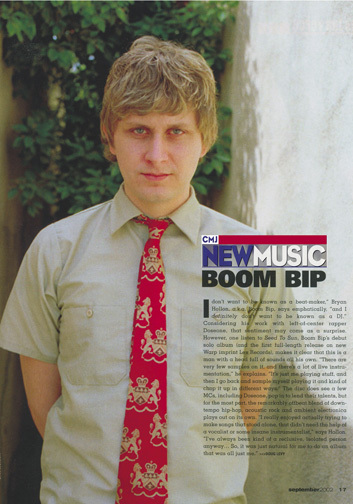 Boom Bip, says emphatically, "and I definitely don't want to be known as a DJ." Considering his work with left-of-center rapper Doseone, that sentiment may come as a surprise. However, one listen to Seed To Sun, boom Bip's debut solo album (and the first full-length release on new Warp imprint Lex Records), makes it clear that this is a man with a head full of sounds all his own. "There are very few samples on it, and there's a lot of live instrumentation," he explains. "It's just me playing stuff, and then I go back and sample myself playing it and kind of chop it up in different ways." The disc does see a few MCs, including Doseone, pop in to lend their talents, but for the most part, the remarkably offbeat blend of downtempo hip-hop, acoustic rock and ambient electronica plays out on its own. "I really enjoyed actually trying to make songs that stood alone, that didn't need the help of a vocalist or some insane instrumentalist," says Hollon. "I've always been kind of a reclusive, isolated person anyway... So, it was just natural for me to do an album that was all just me."